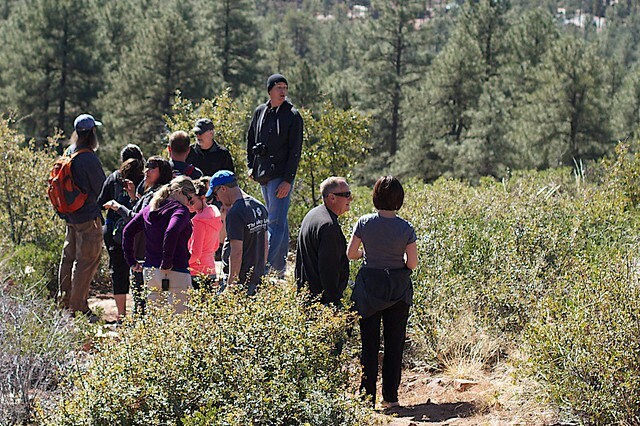 In the Pine Strawberry area, many of the current trail configurations in the Tonto National Forest are primarily a result of historic social usage. Many of these trails follow old routes from ranching or timber operations, fire suppression, or animals. Most were never specifically designed for long-term sustainable recreational use, and as a result they require high levels of maintenance, do not fully protect environmental resources, and fail to provide optimal user experiences. Existing trail characteristics in the area virtually preclude mountain bike use and make for difficult hiking in some areas. Many of the trails in this area suffer from poor design, including extensive use of high water bars and steep grades, and experience tremendous erosion each time a rain or snow event occurs. Because the trail system does not meet many user’s needs or expectations, many have abandoned the designated trails and created a system of social trails. This increases the environmental damage to the forest and raises maintenance costs. The Tonto National Forest’s ability to maintain these unsustainable trails is severely limited by funding and manpower. As a nonprofit community organization formed for the purpose of promoting wildfire mitigation efforts, our goal with this trails project is to increase the value of the Fuel Break surrounding Pine and Strawberry by adding a recreational component, making it more likely the USFS will make maintaining it a funding priority. It will also serve the purpose of helping to keep the natural growth of vegetation to safe levels in this area of protection around our community by allowing easier access for maintenance work inside the Fuel Break, thus increasing our protection from potentially catastrophic wildfire. This project would have an additional impact. In addition to the fire prevention benefits, a trail system could have a tremendous economic impact for the communities of Pine and Strawberry. Trails are a relatively low-cost investment compared to other infrastructure improvements, and generally have broad public and community support. The Pine Strawberry area offers great opportunities for mountain biking, and developing new trails oriented towards this sport in addition to improving existing trails has the potential to revitalize the area and help spur economic development in the private sector. The master plan for Phase One of the project has submitted to the US Forest Service for approval includes an addition to and redesign of the existing system, resulting in approximately 20 miles of sustainable trails; adding new trails that meet the user’s needs, while also protecting the environment and requiring limited maintenance. Environmental and aesthetic impacts in this plan have been managed by the proposed closure of unsustainable sections. These areas will be reclaimed with transplanted native vegetation to conceal the old corridor. After three long years the Forest Service has completed all the environmental studies and given us the green light to begin construction on 8 miles of new trail from behind Camp Lo Mia to the Strawberry Trailhead. The start of this project came about several years ago as a result of a project PSFR did seeding the fuel break with native grass in order to create a low intensity fuel that can be burned off every few years, clearing the fuel break of new chaparral growth and eliminating the need for the expensive hand crews to do the mechanical clearing. While out there casting seed we saw that the section behind the neighborhoods on the north side of Pine was very hard to get to because there is very limited access and steep terrain. It’s also more difficult for the Forest Service to maintain that portion of the fuel break. So the idea of putting in a new trail was born. We partnered with the Northern Gila County Economic Development Corporation (NGCED) and the Mountain Bike Association of Arizona (MBAA) on this project. MBAA provided a grant to hire an experienced trail designer Southwest Trail Solutions and NGCED plans to contribute to construction costs. While this trail was originally planned by PSFR as a fire mitigation measure — allowing better access to the fuel break in that area for maintenance thereby reducing the type of vegetation prone to carrying fire — the Forest Service also cited the benefits of the trail as a wildlife corridor and a fire line. Many other organizations are involved in the project from the recreation standpoint, but the main purpose of this as far as we’re concerned is wildfire mitigation. This project should make not only the neighborhoods there safer, but the entire area. We’ve applied for grants for some of the construction and we’ll use volunteers for other sections of the new trail. The Forest Service is requiring that people wishing to work on the project as Crew Leaders attend recognized trainings (which would be pretty interesting even if they weren’t required!) unless they have previous trail building experience. PSFR hosted an IMBA Trail Building School on Oct 6-7, 2012 in Pine at the Community Center (see event info). Then an Arizona Trail Training Session took place at the Pine Community Center on Saturday Oct 27, 2012. See Our Tail Work Updates for the latest projects and information on how you can be a part of the ongoing progress.